Personal blogs are seldom used to distribute brand messages for Surround clients. Unlike business blogs, corporate magazines and other trade publications there are no programs set up here to deploy content marketing or even display advertising in this medium. The exception however is experiential blogging – when private individuals with lifestyle blogs become brand ambassadors to contextualize an experience. The experiential blog post in which a blogger experiences a client’s goods or services before writing about them has come full circle as a marketing tactic. Born on the internet as ‘web logging’ in the mid 1990s, blogs really came into the mainstream in the early 2000s when ad agencies got involved, and from there ‘blogging for bucks’ took root and raged for ten years until a couple different things killed it. 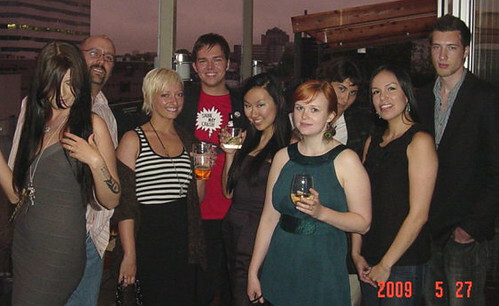 Here are SMOJoe’s Top Ten bloggers in Toronto in 2009 gathered together on the roof of the Spoke Club – those were heady days! Factors that contributed to ‘the culling’ of personal bloggers’ numbers at the end of the decade include the rise Facebook, Twitter, Tumblr and later Pinterest, all of which shifted viewer attention away from long copy media towards shorter, more digestible ‘micro-blogs’. Today individuals can express themselves easier, and be more prolific, and find a wider audience for smaller thoughts, and so in today’s fast-paced modernity who’s going to bother taking the time required to compose more intricate media? The biggest reason to leave paid experiential blogs behind happened in the year 2010 when links to business websites in personal blogs were suddenly devalued by Google as the search giant considered these factors too easily manipulated. Its no secret Matt Cutts and his Spam Team specifically targeted paid reviews and guest posts and other ‘text link’ purposed blogs in the Penguin algorithm updates, focusing with particular intensity on organizations that were exploiting the power of individual blogs by building systems that united publishers with businesses seeking off-page optimization. One by one these platforms failed as webmasters came to suspect their involvement in content / link distribution schemes was hurting their SE rankings. The wheel has turned and blogging has in my opinion re-emerged as an effective marketing tactic when used carefully and correctly, slowly, one or two influencers at a time. There’s a method to the madness, and I believe today it is still possible for one good blog to change a market. Blogs have several benefits for business storytellers and perhaps their greatest attribute is that blog comments become a handy place for business communities to form and grow. The portals give shape to an idea in meaningful content over what would otherwise be a disembodied mass of social media messaging around static web pages. Blogs humanize events by giving attractions a voice online, a personality and perspective. Blogs give business owners the opportunity to host brand conversations ranging from communicating news to hosting other activities exploring the width and breadth of their firm’s impact in the marketplace. I have been watching the development of personal bloggers as a marketing tactic for many years; I have studied all their offers, hired their services, and scrutinized the results of their labours with greater vigour and more frequency than most web marketers. As the proprietor of a long dormant and now crippled Canada Blog Friends website, I was once among this nations’ most prolific blog profilers, and in this capacity came to know some of the biggest names on the Toronto scene. I hired the folks who were doing it right, the ones that knew their metrics and kept their rates manageable. I avoided others who were unmanageable. Today there are a few high profile independent bloggers remaining, or at any rate I don’t know as many. The mature online voices that do exist today however provide a better service to brands by combining their social media into intricate spider webs of influence and SEO friendly incoming links. In this respect it is possible for one blogger with knowledge and ability to shape pg1 search results on Google. Surround account directors have come to know, by watching and measuring results, that personal blogs connected to a prolific author’s busy social media platforms still pack a strong marketing punch because of their ability to collect and deploy social media signals. When a blogger can influence or otherwise convince readers to share their content in some manner, they answer Google’s #1 question ‘who cares about this media?’, and search engines more readily index their content and put higher value on outgoing links to clients. The art of experiential blogging is to leverage an existing community before, during and after the act of experiencing a client’s business attraction. The best experiential bloggers are not afraid to star in their own productions and bring readers along on their journey on all platforms, using their micro blogs to continually reinforce the validity of their central long copy personal blog post. Raymi the Minx’s recent visit to Mint Laser Hair Removal Clinic in Toronto is an example of good experiential blogging. Raymi is a one-woman show who visited the clinic blogged the details and used Instagram to show hair removal video, posted her pictures on Flickr, and Tweeted and Facebook promoted her post to help the business. Good experiential bloggers leverage an existing niche community before, during and after the act of experiencing and then ‘contextualizing’ a client’s business attraction. The best experiential bloggers communicate the subtleties of their journey on all platforms, using microblog posts to continually reinforce the validity of their central long copy personal blog post. 6. Conclude invitation media, updating stories and award prizes – write congratulatory media, publish and promote. 7. Reinforce brand stories about the event in general that may or may not use or link to personal blogger’s media. Experiential bloggers are valuable to society because they communicate the intricacies of a particular program to the consumer and chronicle business trends and detail market sentiment in real time based on the size of their audience and the overall appeal of their messaging. When done well it really is win / win / win because the consumer gains insight, the business gains web market share, and Google gets more juicy content smothered in social media signals to analyze for better search results.